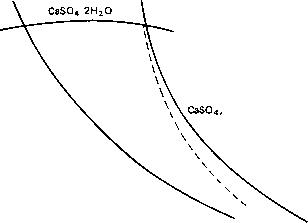 Calcium sulphate scaling occurs as a result of its reverse solubility in sea water, i.e. as sea-water brine temperatures and concentrations increase, the CaS04 solubility in sea water decreases. As calcium sulphate is not at saturation level in normal sea water, it is possible to prevent this scale forming if the distillation process is operated below temperatures and concentrations at which it occurs. As this scale cannot be readily removed by acid cleaning, its deposition must be prevented. Each form has its respective solubility range, the anhydrite being the least soluble and therefore the one which would be deposited first. However, for scaling to occur, three requirements must be met. These are, availability of nucleation sites, supersaturation of the scaling compound, adequate residence or nucleation time. Fig. 3.5. Solubility of CaS04 for varying sea-water concentration and temperature. do not crystallise when the brine is cooled below the point of supersaturation when it reaches the low temperature end of the plant. Fig. 3.6. Solubility produce of CaS04 in sea-water concentrate. Solubility product [Ca] [S04] in (g.mols)2 (kg)"2 Chlorinity in g./1000g. 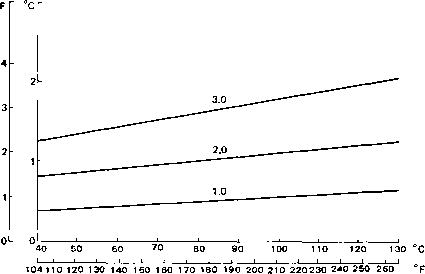 (or concentration) of the sea-water brine with temperature as a parameter. The solubility product K is defined as the product of the molar concentration of ions present, i.e. at fixed temperature while the [ ] symbol denotes molar concentration. Referring to Fig. 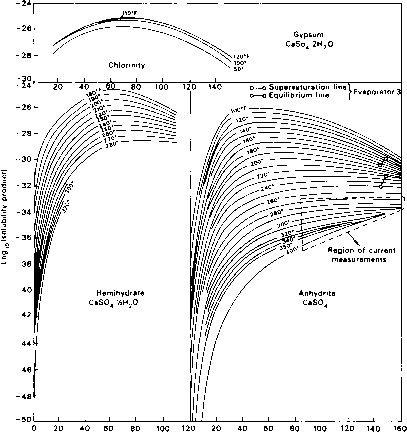 3.6 on the hemi-hydrate curves at a chlorinity of 40 and log10 solubility product of —2.9 gives a maximum temperature of 126°C (260°F) to which sea-water brine of concentration factor 2 can be heated without risk of hemi-hydrate deposition. It is seen that calcium sulphate scaling considerations currently fixes the top temperature at which distillation plants can operate at any fixed concentration factor. The incentives for increasing operating temperature may be readily grasped from the following simplified example. Consider an MSF plant using Hagevap feed treatment with a flash range of 50°C (90°F), i.e. a top temperature of 88°C (190°F) which uses steam near atmospheric pressure (10s Pa) in the brine heater; and another MSF plant using an acid-dosed feed with a flash range of 89°C (160°F), i.e. top temperature 127°C (260°F), bottom temperature 38°C (100°F) using steam near 3.10s Pa (30p.s.i.g.) in the brine heater. Then, all other things being equal, the 89°C (160°F) flash range plant will produce approximately 1.75 times the output of the 50°C (90°F) flash range plant, as output is proportional to flash range if the brine recirculation quantities on each plant are equal. The latter plant gives a much greater output than the former for much the same energy input though the 3.10s Pa (30p.s.i.g.) steam may be more expensive to purchase than the atmospheric pressure steam. There are clear incentives for increasing the top temperatures in MSF plants as generally the smaller the flash range the greater is the capital cost for a given output and much research is being devoted to increasing the top temperature limit. One proposal is the multi-effect multi-stage plant (MEMS) which uses brine with a concentration factor near unity in a high temperature flashing effect consisting of several flashing stages before cascading the brine to another lower temperature effect where it acts as the feed for a brine stream of greater concentration factor.